How Can We Ensure Survival in a New Era of Nuclear Brinkmanship? The era of amnesia is over—if we needed a wake-up call, the North Korean ICBM test supplied it with a vengeance. If ever we needed a wake-up call, the North Korean intercontinental ballistic missile (ICBM) test on July 4 supplied it with a vengeance: The era of nuclear amnesia is over. Ever since the end of the Cold War, we’ve lived without the dread of an overseas crisis that might spiral into thermonuclear war. With the United States alone claiming superpower status, there were few restraints on the deployment and use of US military forces around the world. Now, however, not one but three nuclear-armed powers—Russia, China, and North Korea—have set explicit limits to the exercise of American power abroad, and any attempt by Washington to go beyond those limits risks provoking a military clash with the genuine risk of nuclear escalation. More than ever, we need experienced, levelheaded leadership in Washington to manage the multiple crises arising abroad, starting with the North Korean nuclear threat. Instead, we have Donald Trump, making the situation incomparably worse than it would be otherwise. Even without the presence of Trump in the White House, this would be an extremely hazardous moment. After a long period in which the use of nuclear weapons appeared inconceivable, we have entered an era of global discord in which such use is becoming increasingly plausible. This is true for a number of reasons, as will be discussed below, but the installation of Trump as commander in chief has made the situation far more perilous. Not only does he lack experience in international affairs and military matters, but he has shown himself to be a spiteful, mean-spirited person with a predilection for employing force at a moment’s whim—the last qualities you would seek in the person most responsible for guiding us through a potentially apocalyptic crisis. Frighteningly, it is evident that we will face a series of such crises in the months ahead. Today we face a situation in which the room for American military maneuver in these contested areas has been largely circumscribed. The North Korea threat is so acute because it is evident that Kim Jong-un, the North’s supreme leader, is racing to develop ICBMs capable of delivering nuclear warheads to the American heartland. He hasn’t quite arrived there yet, but the missile test on July 4 demonstrated that Pyongyang is moving ever closer to this goal. This means that Trump, who has vowed to prevent the North from acquiring such a capability, is running out of time to achieve that end. Given the high bar that Trump has set for meetings with Kim—the only assured way to halt the North’s weapons program short of war—it appears we’re edging ever closer to a US military strike that could well result in nuclear escalation. But the Korean Peninsula is not the only place where a military clash could lead to such an outcome. In the Baltic region, US forces are deployed in close proximity to Russian forces, while ships and planes from both sides often operate in the same confined air and sea space, inviting accidents and misunderstandings. And in the South China Sea, American warships patrol off the coast of fortified Chinese-claimed islands equipped with anti-ship missiles and other arms. When relations among these powers were relatively friendly, a minor incident—say, a collision between planes or ships from opposing sides—would normally result in hurried phone calls between the top leaders involved, followed by de-escalation. But in these fraught times, with none of the presiding overlords in Moscow, Beijing, or Washington seemingly capable of backing down, such incidents could easily provoke a show of force on each side, followed by rapid escalation. To fully grasp the nature of the predicament we’re in, it’s important to consider the circumstances that brought us to this point. At the end of the Cold War, there was no foreign power able to contest the United States’ pursuit of global hegemony—no “peer competitor,” as the strategists would put it—and thus no impediment to a sustained US drive to extend American power and influence around the globe. This led to a series of costly and ultimately fruitless wars in the greater Middle East and Southwest Asia, all aimed at ensuring the United States’ dominance of that vital, resource-rich region. It also led (but without attracting as much media attention) to the expansion of NATO eastward, to the very borders of Russia, and to the beefing-up of US military alliances in Asia, creating a chain of US-armed states surrounding (and hemming in) China. South Korea played a key strategic role in the latter effort by serving as the northern anchor of the network to contain China and by constituting a major counterweight to North Korea, a Chinese ally and an autonomous threat to both South Korea and Japan. For a time, it seemed that Washington could advance on all these fronts without encountering significant opposition. But that extraordinary moment of superpower dominance—a time when intoxicated DC pundits described Washington as “the new Rome”—did not last. American forces were stymied in Iraq and Afghanistan, severely damaging the morale and fighting capacity of the US military while eroding the American public’s willingness to undertake prolonged ground wars abroad. At the same time, Vladimir Putin undertook the reform and revitalization of the Russian military, intent on restoring Moscow’s sway over its former dominions in the “near abroad.” China also used this time to invest mammoth resources in the modernization of its armed forces, focusing in particular on the expansion of its air, naval, and missile capabilities—those most relevant to any confrontation with US and allied forces in the western Pacific. Both countries, moreover, sought to enhance the reliability and strike capacity of their nuclear forces, unwilling to cede any advantage to Washington in this critical domain. 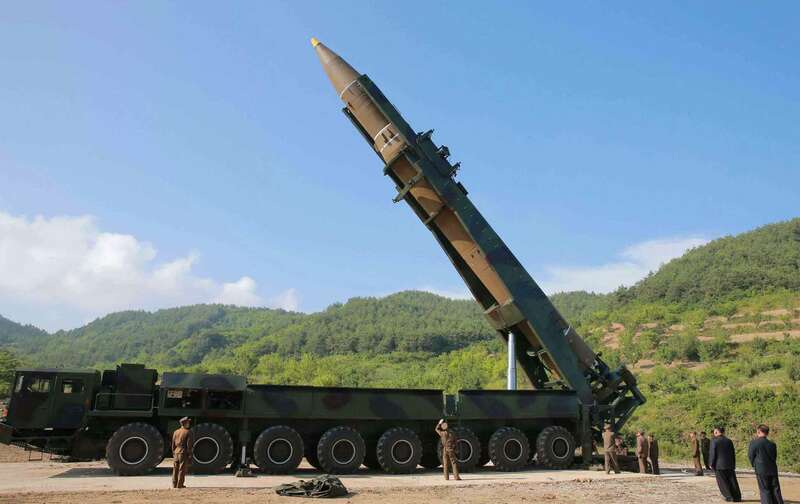 North Korea also used this time to bolster its conventional and nuclear capabilities. Always fearful of invasion by the United States and South Korea, the North Korean leadership—led first by Kim Il-sung, then his son Kim Jong-il, and now his grandson Kim Jong-un—has consistently relied on sheer military might to ensure its survival. This has involved, among other things, the maintenance of a massive army, much of it arrayed along the demilitarized zone separating the two Koreas; the development of chemical, biological, and nuclear munitions; the acquisition of a wide range of ballistic missiles capable of striking US bases and civilian centers in neighboring countries; and the positioning of thousands of artillery pieces aimed at Seoul, the South’s capital and its main population center. All of these military assets, it is believed, are structured in such a way that any attack on the North—or on Kim himself—would automatically result in widespread death and destruction in South Korea, and possibly in Japan as well. As a result, today we face a situation in which the room for American military maneuver, at least in these spheres of contestation, has been largely circumscribed. Any further US encroachments on Russia, China, or North Korea are likely to provoke a strong military response backed by nuclear retaliatory forces in each case. The United States can count on its superiority in conventional weaponry to overcome the comparable forces of its opponent in any such encounter, but its adversaries, well aware of this advantage, have sought “asymmetrical” means of response, including cyber-attacks, submarine warfare, and, in dire circumstances, nuclear strikes. From what we know of North Korean military doctrine, the nuclear option might well be exercised very early in a confrontation, at the earliest sign of a US invasion; under Russian doctrine, it could be triggered by any situation in which Russian armies face imminent defeat by superior NATO conventional forces. The US military, aware of these perils, is developing new delivery systems allowing it greater flexibility to initiate nuclear combat at a lower level of escalation. This was the backdrop of the 2016 presidential election, in which both candidates sought to address the strategic impasse in which the United States now finds itself with vague talk of restoring American military prowess. We will never know how Hillary Clinton would have addressed the North Korea threat and these other challenges, but Trump’s response so far has been bluster, muscle-flexing, and thinly veiled threats. In the case of North Korea, he said in Poland on July 6, “I have some pretty severe things that we’re thinking about.” In that same speech, he heartily backed NATO’s defense of the Baltic region, right on Russia’s doorstep. (However, in his meeting with Putin one day later, he largely avoided antagonistic language and sought to open the door to improvements in US-Russian relations.) In the case of China and the South China Sea, he ordered a US warship to patrol near one of those fortified islands, prompting a furious complaint from Beijing. What comes next? Any further use of military force is likely to risk a comparable response of some sort from the other side, and we could then start on the ladder of escalation. How do we respond to all this? The first step is to banish our nuclear amnesia and absorb the fact that the possibility of nuclear-weapons use is, once again, an ever-present, inescapable reality. Many of us remember a time when this was the prevailing situation, and can recall the massive popular efforts undertaken around the world to prevent nuclear war. We must resume that activism now. Others who weren’t alive during those torturous times will have to educate themselves about these weapons and the strategies governing their use. As various efforts gain momentum, our objectives should be to oppose the introduction of any new nuclear technologies that would invite early use, to accelerate the drawdown of existing nuclear arsenals, and to aim for the ultimate elimination of all nuclear weapons. In this last regard, we should salute the adoption, on July 7, of a new UN treaty banning their acquisition, testing, and use. When it comes to our immediate predicament involving North Korea and the other flash points identified above, our most important task is to warn against any use of military force to resolve tensions and to press instead for negotiated outcomes. It should be made clear—in letters to the editor, letters to our congressional representatives, and other forms of communication—that any military strike against North Korea is almost certain to result in massive civilian casualties, especially of Koreans, as well as the death and injury of numerous American soldiers and sailors based in the region. We must insist that there is a viable alternative: direct talks with the North Korean leadership aimed at forging a peaceful solution, followed by step-by-step measures to halt and then reverse the North Korean nuclear program, coupled with de-escalatory moves by South Korea and the United States. We learned how to speak with the Soviet Union about nuclear-arms control at the height of the Cold War, and we can learn to do the same with North Korea, however much we may dislike Kim Jong-un. That’s what presidents and secretaries of state are paid to do. Regarding the other major flash points, judicious crisis management and the repudiation of military muscle-flexing have to be our top priorities. American leaders need to speak with their Russian and Chinese counterparts about mechanisms for avoiding unintended escalation, for example by devising “rules of the road” agreements that keep warplanes and ships a certain distance from each other when operating in close quarters. New hotlines may also be needed to address any crises arising in the Baltic region or the South China Sea. Perhaps Trump can raise such measures in conversations emerging out of the more constructive relationship he hopes to cement with Moscow, and from future encounters with President Xi Jinping of China. Ultimately, all of the parties to these disputes need to sit down together and adopt a common framework on the limits to military action in this troubled new era.